Steve Woolston would never describe himself as famous, but it’s fair to say that he’s a legend in certain circles, with extraordinary stories to tell. A gun shearer, who loves horses, dogs and fast cars, his childhood was a boy’s own adventure, growing up near Keith in the South Australian bush. Then in the 1960s, he discovered the world of surfing. 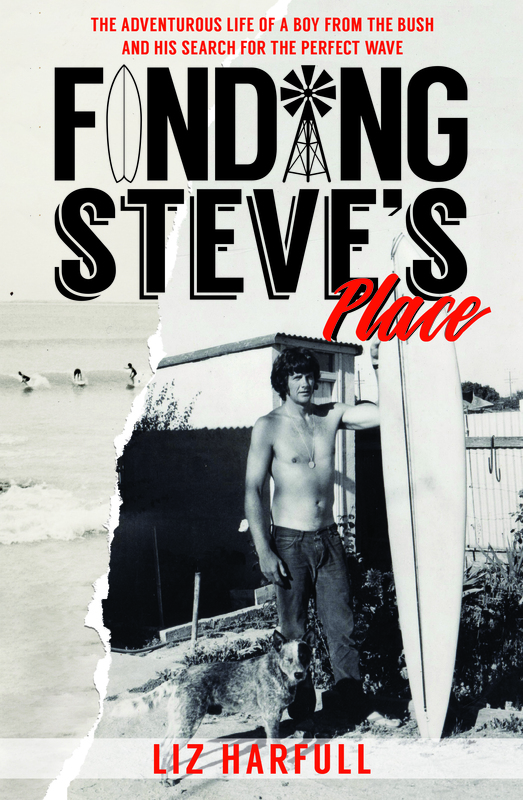 His search for the perfect, uncrowded wave, led him to the sleepy seaside village of Robe, where he set up the iconic surf shop, Steve’s Place, and founded one of the world’s longest-running surfing competitions. ‘From dusty outback shearing sheds to the surf breaks at Robe, Harfull tells Steve’s story with humour and warmth. Populated with characters such as ‘Tuna Fish’, ‘Claw’ and ‘The Mexican’, Finding Steve’s Place delivers a generous serving of laid-back country soul alongside Steve Woolston’s voyage of discovery through surfing and life.’ Kristin Weidenbach, best-selling author, Mailman of the Birdsville Track: the story of Tom Kruse. ‘A cracking tale about the remarkable life of a gun shearer turned gnarly surfer and so much more.’ Leigh Radford, former National Rural Editor, ABC.